Mitsubishi Type 00 Fighters (A6M2 Model 21 Allied codename "Zeke") ready for takeoff on board IJN Shokaku as she prepared to launch aircraft about 0900 Hours on October 26, 1942, during the Battle of the Santa Cruz Islands. Japanese writing in lower right states that the image was reproduced by authorization of the Navy Ministry. American and Japanese planes passed each other in the air. The Americans heavily damaged IJN Zuiho, IJN Zuikaku and IJN Shokaku, and the Japanese caused extensive damage to USS Enterprise (CV-6) and USS Hornet (CV-8). Hornet had to be sunk later in the day by Japanese destroyers after sixteen torpedo hits from two American destroyers failed to send her to the bottom. 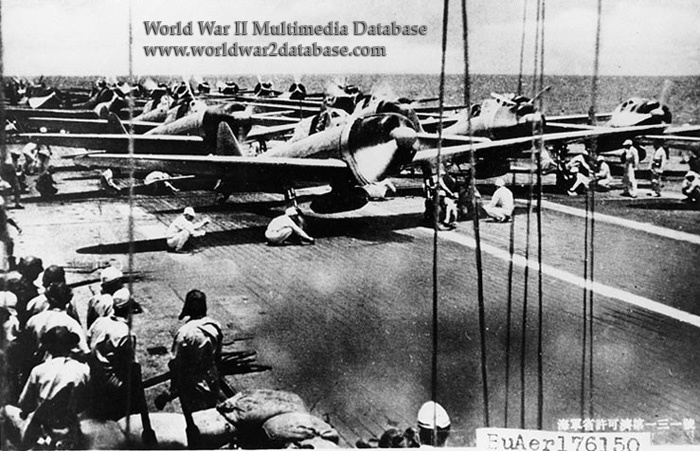 Eleven Douglas SBD Dauntless dive bombers from Hornet under Lieutenant Commander Gus Widhelm found Shokaku at 1030. Three SBDs are shot down, including Widhelm's, who survives. Four to six 1000-pound (454-kilogram) bombs struck the flight deck, one aft of the island and the rest all grouped around the amidships and aft elevators. Large fires are started, and the flight deck is completely buckled and burst by the blasts. Though sixty officers and men are killed, since no aircraft were aboard, no fuel was active and damage control is able to extinguish the fires and save the ship. Shokaku was out of action until March 19, 1943.